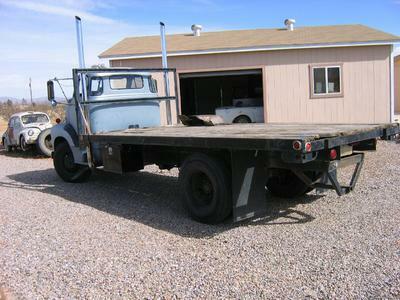 8/19/2014 (Tucson, Arizona) - 1953 GMC COE 2 ton flatbed. Asking $14,000. 400 small block built for this truck has around 20 k miles. Radiator is aluminum cross flow. Transmissions are 4 speed main box and 4 speed auxiliary box = 16 speed. Slide out tool box, extra 50 gallon fuel tank plus the original 20 gallon tank. Receiver, Fulton Sun Pro sun visor, '85 GMC 5 ton rear end and air conditioning (needs condenser). I have owned this truck for 20 years. I use it when needed to haul equipment, cars and hay in state or out of state trips. Traveling freeway speeds empty or loaded it does not over heat. Runs great but needs finishing, interior and exterior paint, door windows are cracked and at this time the wipers need help. If interested in a different drive train I have a 5.9 Cummins with a 5 speed trans that can be negotiated. Inquire at 520 - 559 - 1428, Walt. Join in and write your own page! It's easy to do. How? 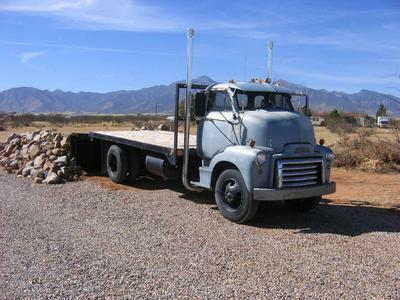 Simply click here to return to Classic Trucks.